It is not a secret that each of us spends a lot of time in the kitchen – here they prepare food and happily enjoy delicious food, gathering with family. In order for both processes to bring pleasure, you need to work hard. Thanks to our advice, you can maintain cleanliness in the kitchen and do it with less effort. Make it a rule to wash dirty dishes and a gas or electric stove immediately after the food is cooked. You will be surprised that this process will take no more than 3-5 minutes. If you do this after some time, you will have to spend extra time and energy, scouring dried spots and frozen fat. It is worth considering that the dishwasher with the remnants of food is an excellent bait for cockroaches and other insects. Get rid of them in the future is very difficult. Wash children’s dishes better with the help of special tools. Do not wash it with the dishes from which adults ate. scaling is disposed of with the help of the most effective means – anti scale. But if you prefer something more natural, then you can boil coca-cola or apple peel in a teapot. Do not forget to monitor the condition of the sponges, brushes, rags and towels. Tips for the hostess for this case will be as follows: rags and sponges should be regularly updated, brushes should be washed and disinfected, and towels should be washed. In the clean kitchen should not be unpleasant smell. So do not forget about the regular removal of garbage. If you use a garbage can, then it must be periodically treated with a disinfectant and washed. It is very good to use a freshener for trash cans, but you can do with improvised means. If you put a small jar of soda in the kitchen and put a few drops of essential oil into it, you will forget about any annoying smell. The aroma will be free to leave if the container is covered with foil with holes made in it. Soda should be periodically shaken and sometimes pour fresh aromatic liquid. It is no secret that unpleasant odors can come not only from the bin. Some products may also emit them. How to eliminate the smell? If your hands smell like onions, they can be processed using a slice of lemon or parsley. When boards and appliances are soaked with such a smell, they are rubbed with salt. Hands smelling garlic can be refreshed using celery greens. Very persistent smell comes from fish. If he stayed on the dishes, then it should be rubbed with salt, then rinsed well with water. The smell of fish, ingrained into the skin of the hands, is removed with a weak solution of table vinegar, and then the hands are thoroughly washed. Often an unpleasant smell comes from wooden cutting boards or dishes. Clean kitchen can be considered only when you thoroughly wash all the utensils that you use to prepare and serve food. If you do not have a dishwasher, then this process is hardly always enjoyable. Some simple tips to housewives in the kitchen will help to facilitate and speed up this procedure. 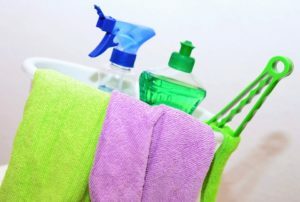 To maintain cleanliness in an apartment, you need strength and time, which for some reason is always lacking. Therefore, useful tips housewives around the house will be very helpful. They will help to easily cope with small problems and facilitate domestic work. When you start washing windows and doors, immediately wet them completely. If this is not done, the resulting dirty smudges will be difficult to remove from a dry surface. If you urgently need to polish furniture made of precious wood, and you did not have a suitable tool at hand, you can replace it with burdock oil. If you want the red wood furniture to regain its original luster and color, it is wiped with strong tea and then dry cloth. Dirty places formed on white furniture, first cleaned with a cut onion, and then use a dry cloth. Wicker furniture can be covered with dust, which is difficult to get in the usual way. In this case, help brush, which is moistened with a strong solution of salt. Heavily soiled glass can be wiped with raw potatoes and then rinsed with cold water. It can be done so that window glass will become covered with dirt much slower. To do this, they need to wipe with this solution – 70 grams of glycerin, 30 grams of water and a few drops of ammonia. Stains from tea and coffee spilled on the carpet can be removed with this mixture: half a liter of water and 1 tbsp. spoon of acetic acid. It wipe the stain, then washed with water and dried. Ink stains on linoleum are cleaned with fine sandpaper. After this procedure, the cleaned place is rubbed with linseed oil or vegetable oil and polished using wool. The greasy stain formed on the carpet is removed with a mixture prepared from washing powder and gasoline. It is left for several hours and then thoroughly washed with hot water. The grease stain found on the parquet floor can be removed with clean gasoline. When hot fat is spilled on the floor, it should immediately be poured with cold water, and if possible, put a piece of ice on it. As a result, the fat will harden and can be safely removed. If your carpet has ceased to please with its colors, then it can be freshened up with such a mixture: grated 2-3 potatoes and water. Her insist for 2 hours, filter and wipe the surface that needs to be updated. So you can do with any carpet. If you smell tobacco in your home, you can remove it. To do this, you need to hang a large towel or sheet that was previously rinsed in water with the addition of a conditioner for laundry. The air in the room will again become fresh, you will feel a pleasant aroma. Make an air freshener can do it yourself. To do this, lay a jar of flower petals – roses or lilies. Layers are interspersed with fine salt. 3-4 spoons of vodka or alcohol are poured on top and give the composition time to infuse (2-3 weeks). Then you can keep the jar and enjoy the natural aroma, devoid of any chemical components. Another important piece of advice – when cleaning around the house, use gloves. Otherwise, not only your manicure will suffer, but also the skin of your hands.To make work enjoyable, you should not save on good accessories and tools. They can last twice as long as their cheap counterparts. We hope that the useful advice to the hostess on the note that you read in our article will have practical value for you. Our goal is to help women feel not obsessed with domestic problems and responsibilities, but free and liberated. And this can only be when domestic work is not tedious and satisfying. We hope that housework will be a joyful occupation for you!